Discover the warming natural aromas of cedarwood and patchouli in this elegant Feu de Bois gift set. With six delicately fragranced candles, each offering eight hours burn time, you can enjoy the luxuriant fragrance of burnt cedarwood and patchouli throughout your home. After a long and stressful day, the calming scent of our Aromatherapy candles will help you to relax, drift off and enjoy a wonderfully peaceful evening. For thousands of years, natural cedarwood oil has been extracted and used in a range of cosmetic and medicinal products, its unmistakable fragrance making it the ideal base note. The Aromatherapy range continues this tradition, filling your home with a soothing, inspirational, and timeless scent. 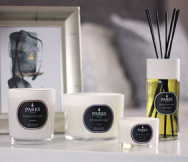 The addition of patchouli, with its bright, floral fragrance, ensures the Feu de Bois six-piece candle set creates a balanced and harmonious mood in any room of your home. Heavier and stronger than other floral-based scents, patchouli offers the perfect accompaniment to the dense notes of cedarwood, creating a rich, powerful blend that evokes the tranquil and soothing environment of a high-end spa. Together, these two fragrances help to promote absolute peace and relaxation, helping you slow body and mind after a testing day. The set includes six individual candles in our smaller tot-size, each lovingly made to our exacting standards, with a soot-free wick for maximum pleasure. Presented in a charming gift box and benefitting from all-natural wax and beautifully-designed keepsake pots, the Feu de Bois gift set makes the perfect gift or a wonderfully indulgent treat just for you.